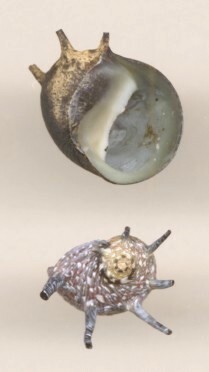 Of this family of mostly tropical shallow-water marine snails, over 175 species live in fresh or brackish waters. All graze upon algae growing on firm underwater surfaces. 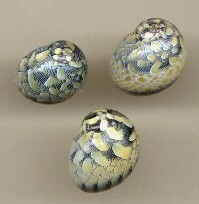 They are notable in having thick variably patterned shells and a calcareous operculum. 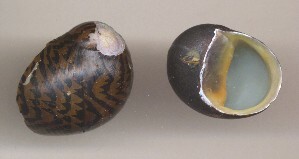 Unlike most freshwater snails where young are born live or hatch directly from eggs, development in the nertiidae involves a planktonic larval form referred to as a veliger. Tom Eichhorst indicates some species cannot reproduce in freshwater aquaria, as their veligers need exposure to saltwater to develop. Theodoxus; Europe, northern Africa, Middle East. Clypeolum; Central and South America, sub-Saharan Africa. Septaria; Rivers and streams of Indo-Pacific islands, Ganges and Hooghly Rivers, India. Fluvinerita; Mountain brooks of Jamaica. The ranges given above are from Banarescu, 1990, Preston, 1915, and Tom Eichhorst, who also provided images, information, and identifications. Names and classifications are currently  under revision. Please note, some of the image filenames, where they contradict the captions, reflect earlier classifications, or misidentification of specimens. Karolin Lohmus has provided a human translation of this page into the Estonian Language. Vitta usnea RÃ¶ding (1798) has priority. Freshwater creeks in Florida, United States. x2. Detail of banding to right, x8. 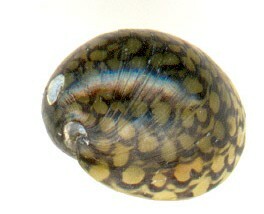 Clypoleum (formerly Neritina) punctulata (Lamarck, 1816). Freshwater rivers well above marine influence, island of Dominica. Photos, Dr. Donald J. Stewart. Great variety of colors and patterns. Photo Â© Stefan Chessa / Germany. Click here for photo collage. Vitta zebra (Bruguiere, 1792) Near Belem, Brazil. T. velascoi (Graells, 1846), Spain. Vittina natalensis (Reeve, 1845) African rivers, in natural state and cleaned. Image; Tom Eichhorst. courtesy of Gerald Depaus, Belgium. ID; Tom Eichhorst. Clithon cf. sowerbiana (Recluz, 1841). Okinawa, Japan. Clithon castanea (Hombron & Jaquinot, 1854). Samoa. Image; Tom Eichhorst. (Broderip, 1832) by some authors. 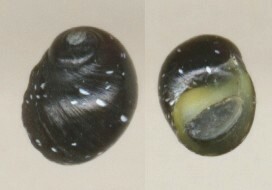 individual are concealed by algae. 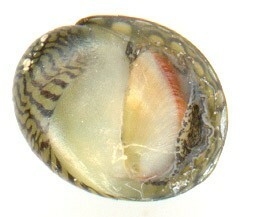 Species in the fhe freshwater genus Septaria possess an internal operculum, completely buried within the foot of the animal. Tom Eichhorst indicates that it may have the function of helping to leverage the animal to the substrate, but it has never been shown for certain what if any function it serves. He provides the following information, along with the images below. 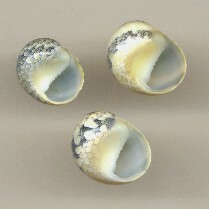 The operculum in Septaria varies in size from Septaria cumingiana whose operculum is almost the same size as the snail's aperture, to Septaria tesselata in which it appears small, thin, and vestigial. Its dark corneous region fits behind the septum. 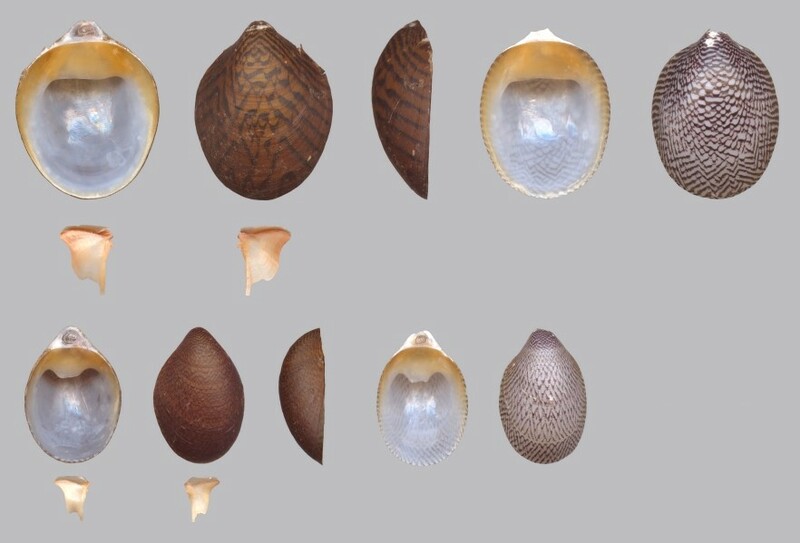 At least four of the thirteen currently recognized Septaria species are sexually dimorphic; S. cumingiana (RÃ©cluz, 1842), S. porcellana (Linnaeus, 1758), S. sanguisuga (Reeve, 1856), and S. suffreni (RÃ©cluz, 1841). 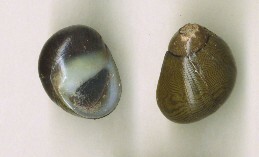 These limpet or slipper-shell like nerites are typically found in fast flowing freshwater streams. Five species are listed for the Indian subcontinent by Preston, 1915. 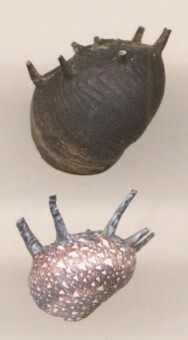 Septaria porcellana (Linnaeus, 1758), with, and without periostracum. Philippines, actual size, 26 mm. 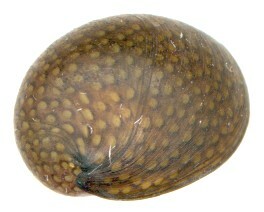 Septaria suffreni (RÃ©cluz, 1841), Samoa. With, and without periostracum. Females, top; males, bottom. Actual size, 18 to 24 mm. Opercula; left, "outward" face, right, "inward" face. Photo Tom Eichhorst.